Enter a patient payment or process a Patient Refund. By default, payments are automatically allocated to procedures, providers, and clinics. To change Payment Allocation settings, see Payment Preferences. To enter a payment, select the charges (adjustments, pay plan debits, procedures) and click Payment or just click Payment. Enter the payment amount and check Prefer this patient to apply the payment to the patient's oldest outstanding charges. Or, leave unchecked to apply the payment to the oldest outstanding charges for the whole family. Click OK to open the payment window and enter the payment details. Clinic: The default clinic is determined by the Account Module Preference, Payments Use Patient: Clinic. Click the dropdown to select a different clinic. Paid By: The name of the patient making the payment. When a payment is split to multiple family members, the payment description will show the paid by name. Entry Date: The date the payment is entered. Payment Date: The date the payment is received. It will be used on Deposit Slips. Amount: The payment amount. This amount must match the total Current Payment Splits amount (see below). Prepay Button: See Unearned / Prepayment. Check #: Optional, but recommended. Check number is a good way to distinguish one check payment from another and find a lost check on a report. Bank-Branch: Optional. Bank-Branch is a good way to differentiate check payments with the same check number and/or same payment amount. Note: A note is automatically added after processing a credit card payment, with the Credit Card Transaction Details. Optionally, add a note that appears in the patient's account as the payment description with the payment type. Notes will show on statements when the Manage Module Preference, Show notes for payments is checked. None (Income Transfer): When checked, the Pay button changes to Transfer or Proc Breakdown and the Outstanding Charges grid groups by patient, clinic, and provider. These options are useful to transfer income. See Income Transfer. Payment Type: The type of payment . Customize options in Definitions: Payment Types. Whether or not a type is selected by default is determined by the Account Module Preference, Payments prompt for Payment Type. 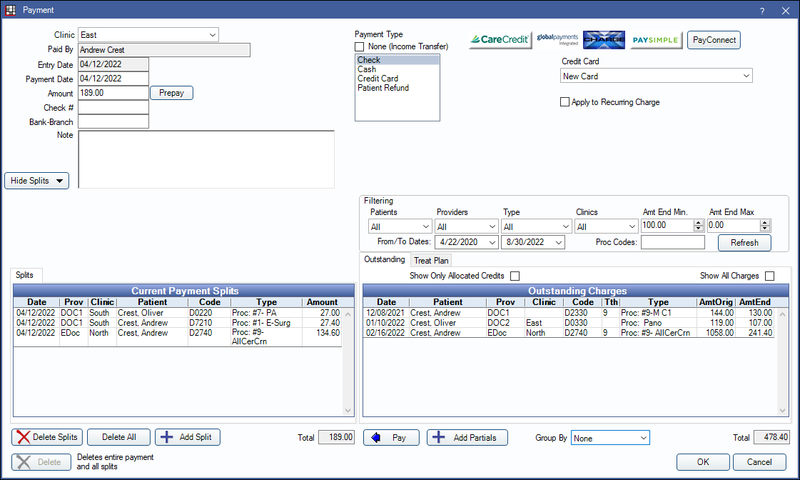 For transactions processed through an integrated credit card program, the payment type defaults to the type selected in the Credit Card Payment program link. Pay Into Account: If using the Accounting feature, and auto payment entries are setup for the selected payment type, use the dropdown to select an asset account to debit or credit the payment to. See Accounting Setup. Hide Splits/Show Splits: Click to toggle between payment split views. The default view is determined by the Account Module Preference, Hide paysplits from payment window by default. Current Payment Splits: Lists this payment's current Payment Splits (paysplits) allocated to providers, clinics, patient, procedure, adjustments, pay plan charges, etc. It also lists unallocated paysplits (Unearned / Prepayment). Double-click a row to edit, see Paysplit Reallocation. Delete Splits: Delete the selected paysplits from the grid. The total amount of the deleted split is added back to the Amt End under Outstanding Charges for future splits. Delete All: Delete all the paysplits in the grid. All paysplit amounts are added back to the Amt End under Outstanding Charges for future splits. Add Split: Manually add a paysplit. Total: The sum of all current payment splits. The Total must match the total payment Amount. Outstanding Charges: Lists all adjustments, pay plan charges, and completed procedures in the family that have a balance remaining (patient portion due). Amt Orig: Amount owed on a charge prior to any payments, adjustments, or insurance estimates. Amt Start: Amount owed on a charge after all payments, adjustments, and insurance estimates but excluding the current payment. Amt End: Amount owed on a charge after all payments, adjustments, and insurance estimates including the current payment. Total: The total amount of all the selected outstanding charges. To change what shows in grid, use the Filtering options. Show Super Family Charges: Show or hide unpaid adjustments, pay plan charges, and completed procedures for a Super Family. Show All Charges: By default, only unpaid adjustments, pay plan charges, and completed procedures in the family show. Check this box to also show paid charges. This may be useful if your outstanding charges are not correct. Patients: Use the dropdown menu to view outstanding charges for a specific family member. Ctrl + click to highlight more than one family member. Providers: Use the dropdown menu to view outstanding charges for a specific provider. Ctrl + click to highlight more than one provider. Type: Use the dropdown menu to view specific charge types (e.g. adjustments, procedures, or pay plan charges). Clinics: Use the dropdown menu to view charges for a specific clinic. Ctrl + click to highlight more than one clinic. Amt End Min: Enter a value to limit the outstanding charges with a minimum remaining balance greater than or equal to this amount. Amt End Max: Enter a value to limit the outstanding charges with a maximum remaining balance less than or equal to this amount. From/To Dates: Enter a value or use the calendar drop down to select a date range. Only procedures completed in this date range will show. Proc Codes: Narrow the outstanding charges by procedure code(s). This field is case sensitive. To enter more than one code, separate each code with a comma (e.g. D0210,D1110). Refresh: Updates the grid when filtering options are changed. Group By: Change the grouping of items in the grid. None (default): Show all charges for all patients in the family, sorted first by date (oldest charge at the top), then by procedure code. Provider: Combine each family member's outstanding charges into one row per provider. When grouping by provider, the Type and Clinics filters are disabled. Clinic and Provider: Combine each family member's outstanding charges into one row per provider and clinic. When grouping by clinic, the Type filter is disabled. Pay: Create paysplits for the selected outstanding charges. Transfer: When None is the payment type, the Pay button changes to Transfer. Useful for Income Transfers. Proc Breakdown: When None is the payment type and the Account Module preference, Enforce Valid Paysplits is set to Enforce Fully, the Pay button changes to Proc Breakdown. Useful to manually transfer income with the Pay Split Manager. Add Partials: Create a paysplit for only part of an outstanding charge. Allocated tab: Only shows if the payment has an unallocated split that has since been allocated to a provider/procedure. Click to view the paysplit allocations. Informational only. Print Receipt: Reprint XCharge or PayConnect receipts. For XCharge, only receipts generated when using version 15.4 or greater can be reprinted. This button only shows if a receipt already exists for the transaction. Email Receipt: Generate a PDF copy of the XCharge or PayConnect receipt and email it to the patient. A copy of the receipt is saved in the patient's Images module. Delete: Delete the entire payment. Only enabled on existing payments. OK: Post the payment to the patient account. Payments allocated to procedures for multiple family members will post to each patient account. Cancel: The behavior of the cancel button varies depending on the point you are at in the payment process. New payment no credit card transaction: If this is a new payment and no credit card has been processed, cancel deletes the payment. New payment with a credit card transaction: If this is a new payment and you just processed a credit card, cancel voids the credit card transaction, posts the payment, and posts and a separate voided payment. Editing an existing payment: Cancels any changes made in the payment window.